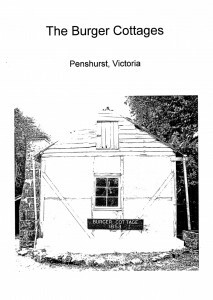 This compilation of documents lists details concerning the Burger Cottages situated at 71 Springfield Lane, Penshurst, Victoria, and the application to the Uebergang Foundation for funding for the preparation of a Cost Management Plan (CMP). This would lead to appropriate activities, as recommended by the CMP, to protect and preserve the Cottages which are of historical and architectural significance. There is a strong connection between the Burger and the Uebergang families. Stuart Burger, the applicant for the funding, is the great-great grandson of Gottlieb Uebergang, from one of the four branches of the Uebergang family who migrated to Australia in the nineteenth century. The two buildings at the Burger family farm were built c.1853 by the Wendish immigrants Peter Burger (1795-1878) and his family. The Burger farm was part of the settlement of Gnadenthal, near Penshurst, founded in the early 1850’s by Wendish immigrants. The following statement is from the Victorian Heritage Database: “The Burger Cottages are of architectural significance as possibly the only surviving example in Victoria of the rare lehmwickel (earth winding) technique, an unusual vernacular building method which probably originated in the medieval period in France and Germany…” In this building method, split stakes of the local timber were wrapped around with layers of mud and straw to form a cylinder. These cylinders were packed closely together in rows in the spaces between the framing timbers or ceiling joists.